This is a strange game from a new company. In fact, Entertainment Enterprises Limited was only making their second coin-op appearance with Vampire. The player controls a vampire who stalks the streets of a European village in search of women. You've got to bite six of them before sunrise, while avoiding "holy men" (priests), nuns, and holy water fountains. Coming into contact with anything sacred will result in the vampire dying and turning into a skeleton. For some real fun, he can touch his coffin and turn into a bat for some faster travel. Either way, our hero must avoid wooden stakes and can kill the holy men for 600 points apiece. Meanwhile blondes are worth 300 points, while redheads are worth only 200. (One supposes that not only do blondes have more fun, but they're also harder to catch). There are four different screens with the first being the European village. The second one takes place in a graveyard with some very confusing stairways, while the third features the vampire's castle, which resembles a church (especially since his prey is a bride dressed in white). And the final screen is a bonus round where you have to use the joystick to plant the kiss of death on the neck of a woman for 2,000 points. The control consists of a joystick and a shadow button which, when pushed, gives the fiendish bloodsucker the ability to disappear from sight, and leave an apparition behind to confuse approaching enemies. The graphics in Vampire aren't bad. The village and graveyard screens offer an intricate three-dimensionalized maze but, unfortunately, the effect make maneuverability difficult. The people in the game resemble zombies. They amble aimlessly about and bump into everything in sight. It's no wonder so many video game characters are usually robots. However, the main character does wear a very villainous look on his face, as though he really enjoys his work, and when he grabs a woman, there's a nice visual effect of his cloak being put around his prey before he starts necking. Altogether it's an ambitious and not unsuccessful attempt to create a video game that uses a horror theme. The major disappointments are with the soundtrack and game play. This is an effort that cries out for mood music, but all you get are a few mediocre sound effects. In addition the pace is very slow, difficult, and frustrating, although E.E.L. promised that they were going to speed it up. Moving the vampire around is still bound to be a very difficult task, however, since there are some joystick problems. Vampire is a good novelty game. It tackles a difficult theme and handles it very well. Not many coin-op companies have attempted to design a game with a horror theme. After all, this isn't for everyone's taste (pardon the pun) but in an era during which big-time manufacturers are bending over to please the parents' groups and pressure groups that want to put them out of business, it's so nice to see a game that stands for everything that's rotten and evil in this world. so far as I know the ROM images for this game have never been dumped for posterity. 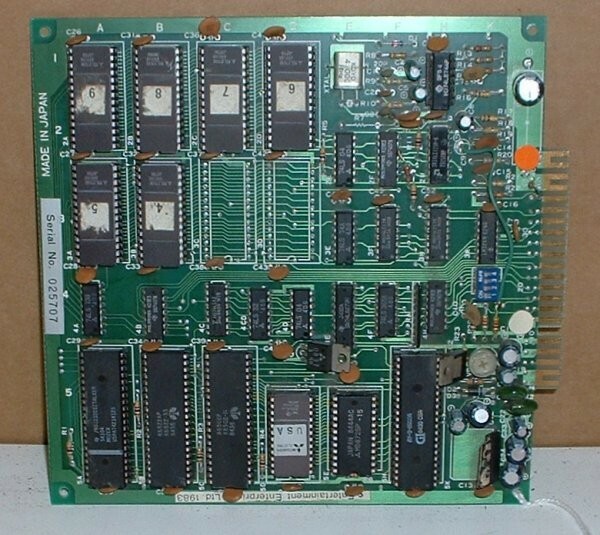 In this thread at the KLOV forums, it is suggested that the PCB pictured above may be from a Japanese bubble-hockey game. 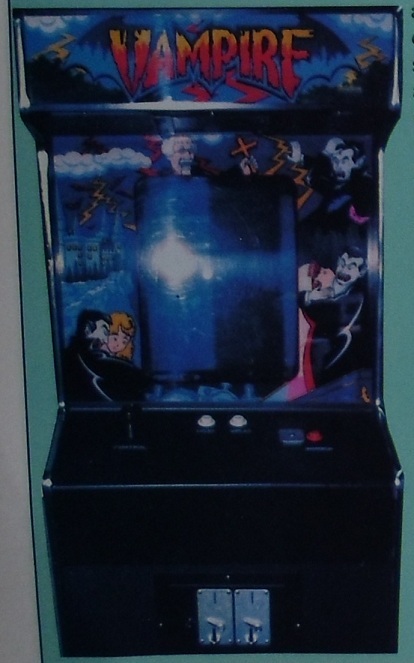 It has also been noted that the cabinet pictured above and the general gameplay mechanics could suggest that Vampire existed as a conversion kit for Congo Bongo (which in turn used similar hardware to Zaxxon). Former Twin Galaxies Chief Referee Robert Mruczek has reported that he played the game at an arcade at Broadway and 51st Street in Manhattan back in the 80's. "Vampire" is a title I have only seen in one single arcade...Broadway and 51st Street in NYC years ago. Walter knows the place which is long since gone. And this was when they were a split-level arcade, before the pinball crowd took it over, and while the pool hall was still downstairs. 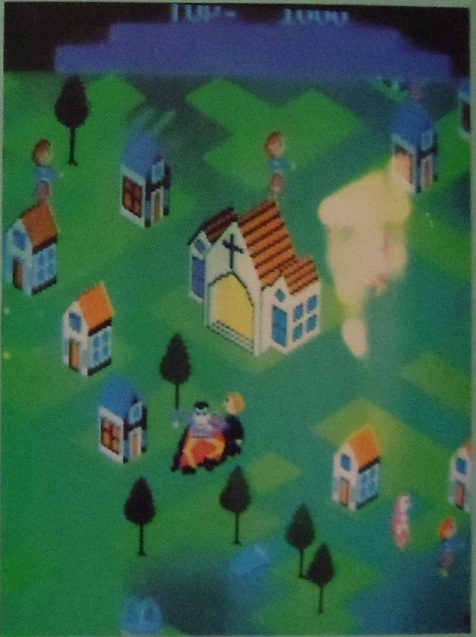 In this game, there was an overhead perspective not quite 2 1/2 D like the "Sims", but close to it. Your vampire started at the top of the hill in stage 1, and gets out of his coffin. The goal was to bring him down the hill, but "clerics" chucking holy water at you were the main obstacle, and no matter what we tried, we just couldn't get past even the first stage...didn't even reach the end !! So, can't say more than that...never lasted long enough at it, but not for lack of trying. It must be "do-able", and now that we're all wiser gamers I'm sure someone today can figure it out...if it ever is discovered, that is. Honestly, this is the ONLY game...ever...that I could never clear so much as the 1st stage at. You're a vampire trying to avoid in stage 1, in a Q*Bert-like perspective but on an ever-downward cascading layout, holy water-throwing priests and such. I doubt I ever lasted more than 20 seconds on a single life on this game and to this day have always wanted to figure out the one challenge that eluded me from my gaming heydays. I was able to get more than 5M each on Defender, MC, Robo, SW (as we know) and more, and yet this one stupid title I couldn't figure out the very 1st stage. And by the looks of it I'll never know.